Like Sinatra, Levine gives High Hopes! George Steinbrenner once said to me that since I was given a chance at doing good things with my life, all he expected back was that I always help thy fellow man. A few years later through my relationship with the Boss and Yanks manager Billy Martin, I would get to meet the great Frank Sinatra, both at Yankee Stadium and at the great Italian restaurant, Patsys. He said that he once shot a segment of a show with a bunch of little kids and they sang his own song, High Hopes. What that moment meant to those kids and their parents was something that meant the world to him and years later he would run into some of those kids and they would tell him the impact that the opportunity had on their lives. It is something that I would never forget because Mr Steinbrenner and Billy were exactly the same way. A couple of weeks ago I went to the funeral of a young man that had been shot due to gang violence. His mom had told me that had she had the money for a baseball league fee that her son probably would still be alive. And then just recently got a call from a friend of mine who told me about a young boy that was depressed because his family was not able to register him in youth baseball due to financial restraints. They were hoping that maybe through the magic of the Yankees this boys spirits and aspirations could be brought to another level. For over an hour on Tuesday morning I was stressing out over how I could make this dream come true. These are the dog days of the baseball season and the last thing that I wanted to do was to bother my supervisor, team President, Randy Levine. So, I decided to call Mr Levine for help. I could tell that he was extremely busy but he asked about the situation and said that he would take care of it. 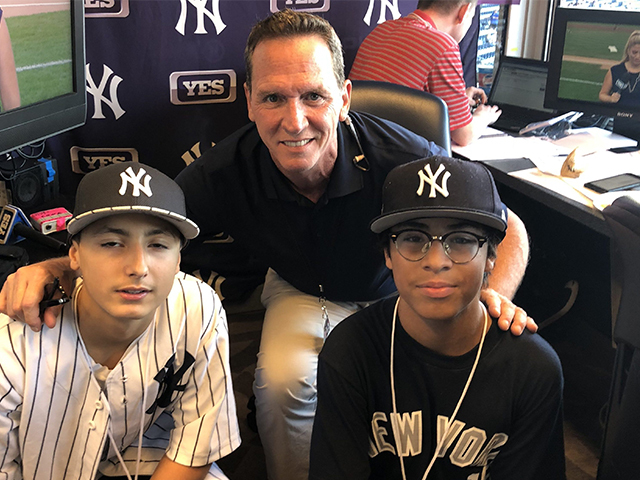 Let me just say that with the great assistance of Randy Levine and other Stadium personnel, some of the players from both the Yankees and White Sox and of course my great friends the Marrero family, a young boy from the tough streets of the Bronx has HIGH HOPES again. Young Nelson Santiago was just overwhelmed with the attention and couldn’t believe that Randy Levine and the New York Yankees would care about some Spanish kid from the Bronx. Well Nelson, I can honestly say that they do and they have for a very long time. I personally know that for a fact. I was one of those Spanish kids from the Bronx. Special thanks to The Boss, Billy and Mr Sinatra!